The Bed & Breakfast Lit De Senne Brussels is situated in the heart of the city’s historic district, making it one of the ideal Brussels hotels for exploring. Grand Place is only 500 meters away. 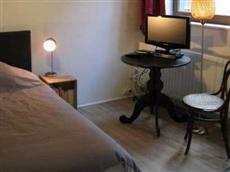 Guests will also find that the hotel offers easy access to Mannekin Pis and other local attractions. The Bed & Breakfast Lit De Senne Brussels is situated 3 minutes from the nearest metro station, and the central station is only 2 stops away. Metros, cars, and taxis offer access to local attractions as well as the Brussels Airport. All of the guestrooms at the hotel offer wireless Internet access. Each of the 2 guestrooms includes a television and a king sized bed. Private bathrooms can also be found in each of the guest rooms. There are numerous shops and restaurants located within easy reach of the hotel. There is a complimentary breakfast offered onsite every morning. The hotel also offers a shared kitchen and lounge for guests to enjoy.